American Friends Service Committee/Atlanta: Moral Monday's Coming to Georgia? Moral Monday's Coming to Georgia? Good jobs, good education, health care, affordable housing, women’s rights, an end to police brutality, LGBTQ rights, voters rights, civil rights for all, access to healthy food, our environment. These are the things people of conscious care about and want in our communities. Yet our state lawmakers continue to attempt, year after year, to pass policy that strips these things from our communities. We need a movement in Georgia. In 2012 North Carolina faced what some call the harshest legislative session ever. Among some of the worst bills facing the state was a bill that restricted voter rights, serious cuts to unemployment benefits, cuts to medicare, tax breaks to the rich, a repeal to the Racial Justice Act, restrictions on abortion rights, education budget cuts, and restrictions on the right to protest. The Moral Monday movement was a response to a historically oppressive legislative slate. Every Monday thousands of North Carolinian's gathered at the State Capitol in protest of a specific oppressive piece of legislation, they would then enter the building and many would perform acts of nonviolent civil disobedience. In all over the course of eight weeks over 1000 people were arrested and the protests grew from 1200 to over 10000 people. Many believed the movement would go away after the session was over, instead it continued to grow. Moral Monday protests have now happened in almost every district in North Carolina, and seem to continue to be growing. We know that we are facing a very similar legislative session here in Georgia.We can no longer afford to work within our small dedicated groups here in Georgia; we can’t afford to exclusively work under the banner of our organizations alone. North Carolina has shown us where to start and how to build a broader movement in Georgia. 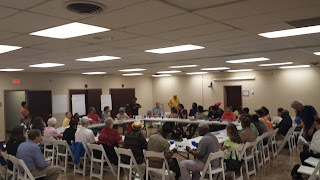 Last night over 50 people showed up to a Moral Monday Georgia planning meeting! 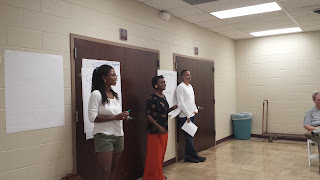 There's certainly a long hard road ahead if we are to build the bold movement we are seeing in North Carolina, but last night exciting first steps were made, and American Friends Service Committee's Atlanta Economic Justice Program is excited to walk hand in hand with the dozens of other organizations and individuals in the process. Click here to get details on the next planning meeting. Bold Action Brings Historic Victory!